Responsible consumption and production is about promoting resource and energy efficiency, sustainable infrastructure, providing access to basic services, green and decent jobs and a better quality of life for all. Its implementation helps to achieve overall development plans, reduce future economic, environmental and social costs, strengthen economic competitiveness and reduce poverty. 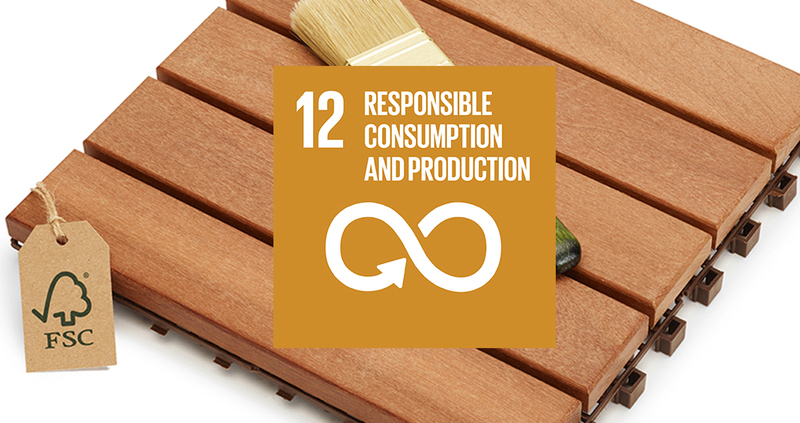 FSC is a tool to promote sustainable consumption and production and, as such, contributes to goal 12 of responsible consumption and production. In terms of production, FSC requires management practices that maintain the resource base while harvesting forest materials and providing services. The FSC certification system offers an opportunity businesses and consumers to source from well-managed forests, providing a vast array of responsibly produced materials for construction, wood panels, floorings, furniture, paper, etc. In this way FSC contributes to SDG targets on sustainable management and efficient natural resource use, on company reporting on sustainable practices and on information and awareness. More and more public authorities require sustainable sourcing in their purchasing policies and recognize that FSC certification provides evidence of this. FSC therefore also contributes the SDG target on sustainable public procurement. FSC promotes and rewards, through the FSC Mix and FSC Recycled labels, the reclamation and recycling of wood materials; this contributes to the SGD target on waste reduction. Lastly, FSC’s presence in a number of developing countries, in the form of FSC national organizations and/or certificate holders, contributes to the target on capacity-building in developing countries for more sustainable patterns of consumption and production.